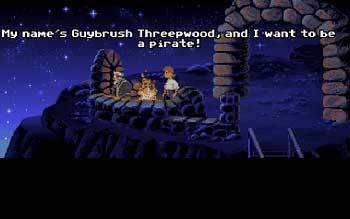 Ron Gilbert doesn't think Disney's going to do anything with his landmark point-and-click adventure. "It's kind of sad in a way," says Ron Gilbert, creator of some of the most well-known point-and-click properties in gaming's history. "Yeah, I wish I owned Monkey Island and Maniac Mansion, you know?" But he doesn't; Disney does, and Gilbert doesn't hold out much hope of getting them back. When Gilbert left LucasArts, a subsidiary of Lucasfilm, the games he made with that developer were still in George Lucas' hands. Gilbert was more or less content with that arrangement; since that was where he made the games, he was happy for them to stay there. Gilbert never thought that Lucas would eventually sell the whole shebang to Disney, but he did, and now Gilbert's wishing he could do something to get his old games back. "And they've even said," Gilbert bemoans, "they said they're really focused on mobile games. They're just not doing PC games." Gilbert thinks his old properties will languish in Disney's basement forever. Not that Gilbert has much hope of buying his games back from the Mouse; anything Gilbert could offer would look like chump change to Disney. Besides, it's not Disney's style. "[It] just seems to be a company that hoards IP," says Gilbert, "and that kind of worries me."